It's easy to appreciate Zadar sights because the historical centre is a compact pedestrian zone, perfect to explore on foot and discover Zadar's history. 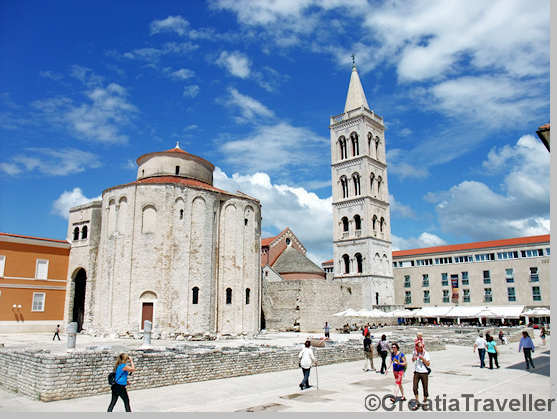 Begin your tour of Zadar by admiring the defensive walls that protect the city on three sides. They were built first by the Venetians in the 16th century as a defense against the Turks, then reinforced at the end of the 19th and beginning of the 20th century. The oldest part of the walls is on the eastern side where a footbridge connects the old town with the newer parts. 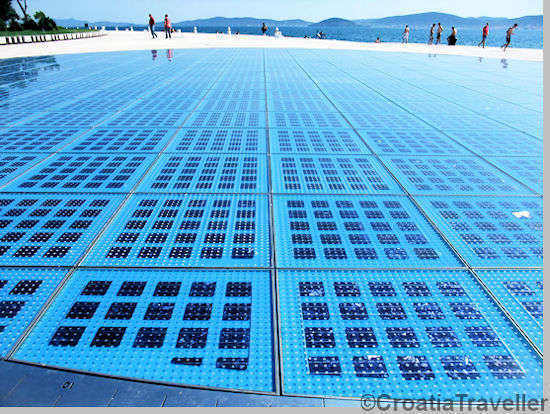 Zadar's walls were named a World Heritage Site in 2017. There are four medieval gates. The 16th century Port Gate, opposite the footbridge on Zadar's northern quay was built in 1573 to celebrate the victory of the Christian fleet over the Turks at Lepanto two years prior. 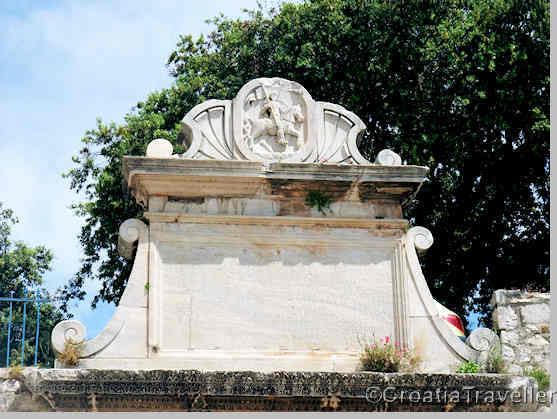 The coat of arms of Zadar is in relief with a carved statue of St Chrysogonus on horseback. 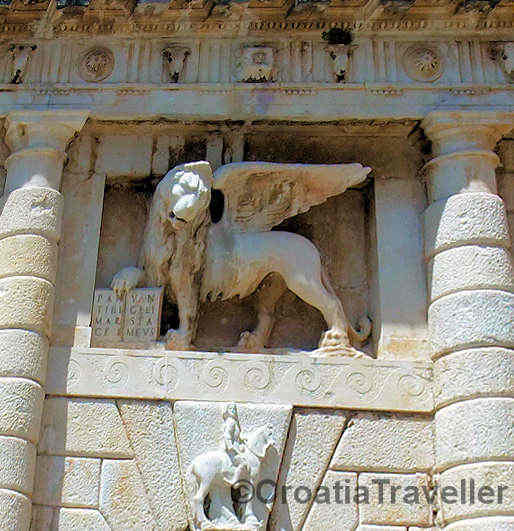 Zadar's main southern entrance is the ornate, late-Renaissance Land Gate dating from 1543 with a snarling Venetian lion over an effigy of St Chrysogonus on horseback. The coats of arms and inscriptions adorning this imposing gate seem ready to welcome visitors of the highest importance. No matter which gate a visitor entered, a road leads to Narodni trg or People's Square. This stately square is where medieval proclamations were made as early as the 13th century. The City Guardhouse (above) is a fine example of late Renaissance architecture. 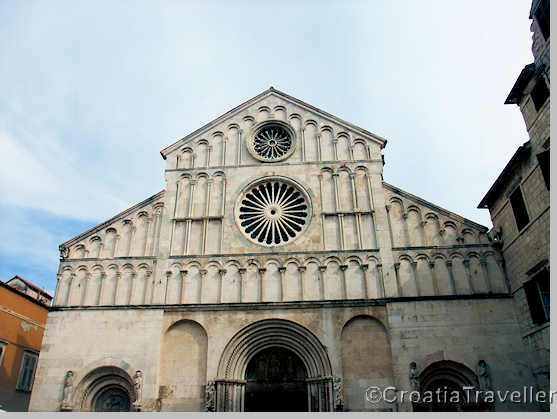 It's the biggest cathedral in Dalmatia, dating mostly from the 12th century and built on the site of an early Christian church. The facade is adorned with rows of blind arcades which stress the three-aisle structure. The large rose-window is Romanesque and the smaller one above it is in the Gothic style. The relics of St Anastasia lie in a marble sarcophagus on the altar in the left apse. Bishop Donat commissioned the repository in the 9th century. Just a few steps away is the Museum of Church Art. 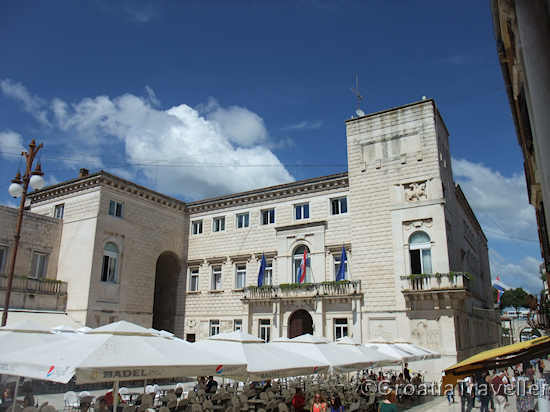 Housed in a Benedictine Convent, this museum is often and more aptly called the "Gold and Silver of Zadar". Covering a period that extends from the 8th to the 18th centuries, this collection of intricately worked gold and silver is a tribute to the wealth and power that Zadar once enjoyed. Also on display are religious paintings including a painting of the Madonna and Child by Paolo Veneziano. 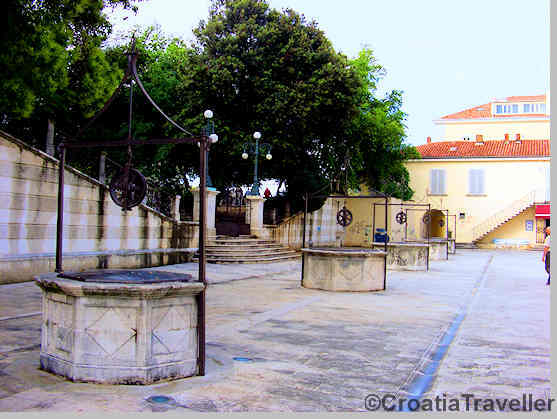 Head back toward the Land Gate and you'll come to the Trg 5 Bunara (Square of the 5 Wells). The square is built on top of a moat. In order to withstand a possible siege by the Turks, a cistern was built here in the 16th century. The square is bounded by a leafy park constructed in the 19th century. 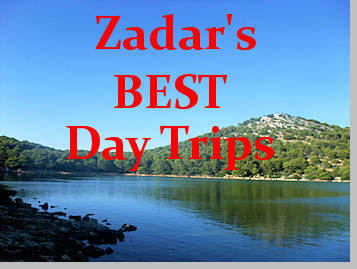 A tour of Zadar's Roman highlights begins at the Roman Forum. The Roman forum dates from the 1st century BC. Construction continues until the 3rd century AD. It's the largest forum in Croatia. Notice the pillar on the north-western side called the "Pillar of Shame". It's where evildoers were chained and humiliated in the Middle Ages. 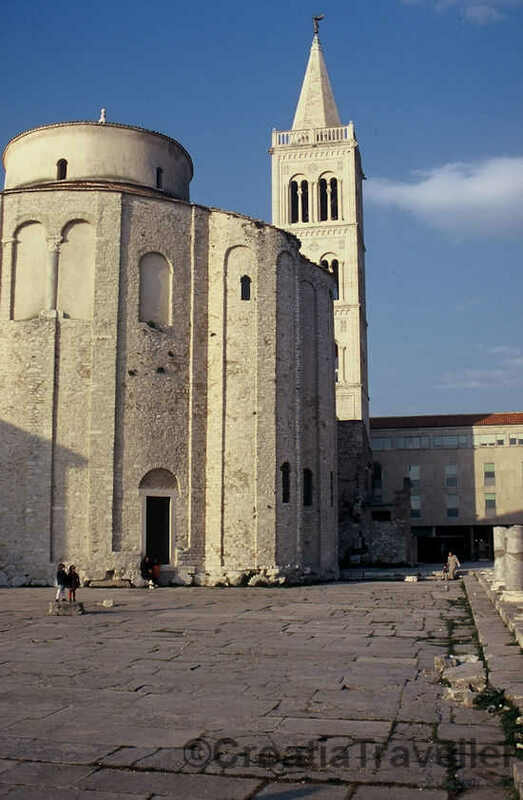 The forum is now dominated by the Church of Saint Donat, Zadar's most recognizable monument. 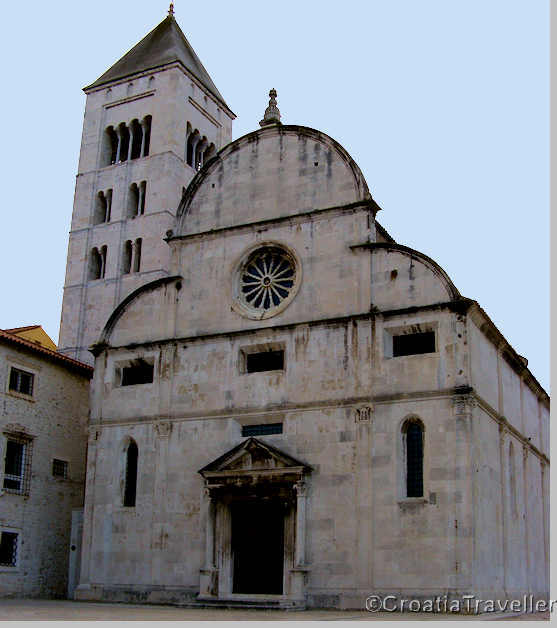 This round pre-Romanesque church dates from around the 9th century and has become a sort of symbol of Zadar. First mentioned by Emperor Constantine in the 10th century, the church was named after the bishop who allegedly instigated its construction. With a round, central building and three semi-circular apses, its features are most unusual. Now de-consecrated, it's largely empty inside but the excellent acoustics have made it Zadar's premier concert hall. 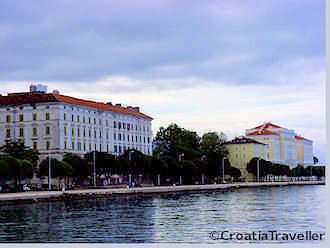 Now take a walk along obala Kresimira IV, or Riva the southwestern quay. The tree lined waterfront promenade is a popular hangout for locals and visitors. 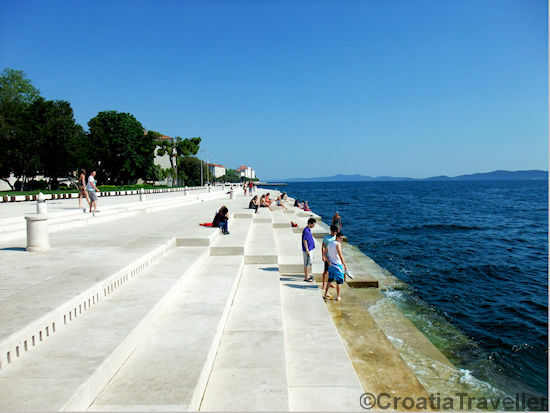 By day it's perfect for sunbathing, picnicking or even taking a quick dip in the water all to the tune of the Sea Organ, designed by local architect Nikola Basic. This unusual organ is powered by the wind and the sea. When the sea pushes air through the whistles, a series of melancholy chords are played, with the sound emerging through the perforated stone stairs. You have to hear it to believe it! But it's when the sun dims that Riva is the only place to be. It was here that Alfred Hitchcock once remarked that Zadar's sunsets were among the world's finest. Enhancing the experience is the remarkable Greeting to the Sun also designed by Nikola Basic. This circle of glass collects the sun's rays by day, stores the energy, and emits it as a magical light show after dark. Opened in 2008, this unique museum exhibits ancient, primarily Roman glass found in and around Zadar. The museum holds more than 2000 glass objects from the 1st century BC to the 5th century AD. This new museum (more like a gallery) showcases optical illusions of all sorts from holograms to "rotating" and "anti-gravity" rooms. It takes about an hour and is good family fun. 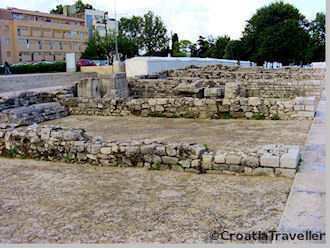 Most interesting is the model of Zadar under Roman rule but the prehistoric pottery fragments and remnants of Illyrian Zadar are also worthwhile.